Snowshoeing is really just walking but with snowshoes to stop you sinking into the snow, and to give you better grip on icy terrain. It is the ideal way to discover and enjoy snowy terrain in the Winter! Heading out walking in the snow is a great way to beat back the winter blues with an injection of sunshine and physical activity, especially when, at the end of the day, or at lunch time, you arrive in a warm and cosy restaurant or refuge for a hot drink! 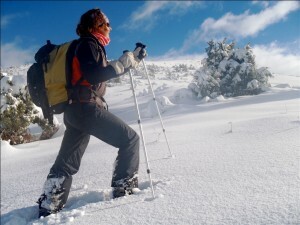 If you are a Summer hiker and dream of discovering the mountains in winter, snowshoeing is for you. 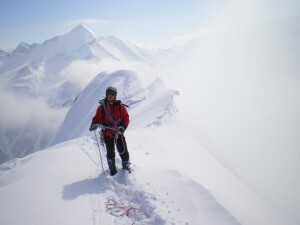 It allows you to discover the winter face of the mountains, quite a different experience. Snowshoes were first used by Canadian trappers with huge and heavy basket-type racquets for hunting in the middle of winter. The large surface area of the snowshoe spreads your weight out, stopping you from sinking into the snow. 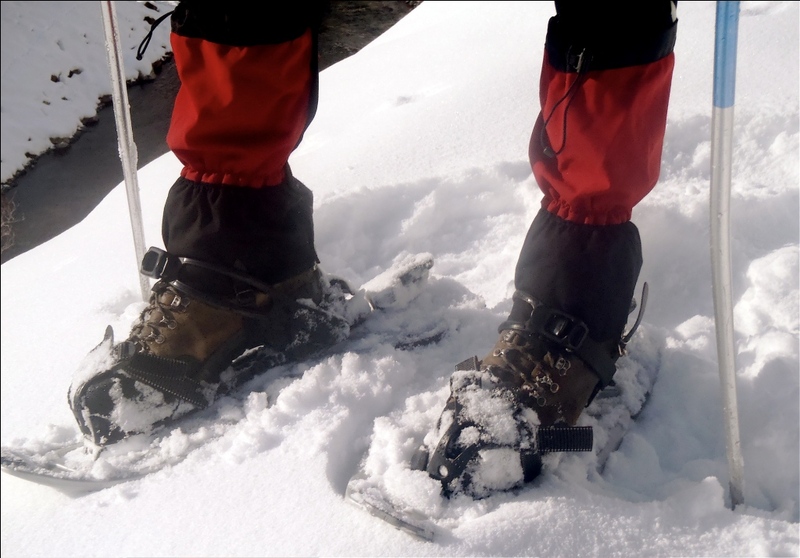 Today snowshoes are made of light-weight plastic and are in the form of a narrow tennis racquet. They are simply strapped onto your winter boots (normal waterproof hiking boots with ankle support are fine) and allow you to walk on the snow without sinking in. Poles are essential for extra push and for balance, making the whole thing even simpler. After a short training session on your newly-obtained bigger feet, walking with them will quickly feel very natural. 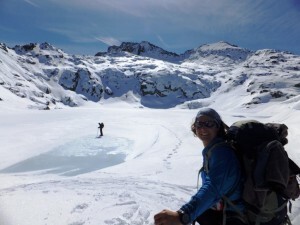 Join Mandy and Sacha snowshoeing this winter. Dates in green are confirmed, dates in orange have interest. Pyrenean Snowshoeing: Spend a week in the cosy Hotel Les Templiers or Blue Cairn Lodge and head out each day to discover a new face of the Pyrenean winter experience. Four days of snowshoeing and two days optional activities give you a varied and fun experience of winter in the mountains. 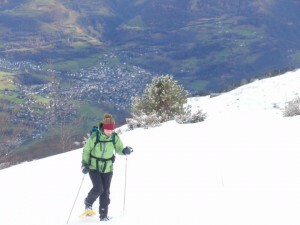 You can do some downhill skiing, cross country skiing, take the cable car up to Pic du Midi (best combined with a day downhill skiing at the Grand Tourmalet resort), go to the market in Argeles, try paragliding, go dog sledding – or try some of the local snow-free walking trails independently. We are here to facilitate and make sure you have the best experience possible. Dates: every week from 5 Jan – 13 April 2019. Runs from two participants, so find a friend and we can confirm, or let us know your preferred date and we’ll encourage someone else to come then too. Winter Revitalise: Snowshoeing, yoga and thermal baths – this is a combination to reinvigorate your winter ! Lodged in the Val d’Azun you will spend your days snow-shoeing in the spectacular valleys surrounding us. The magic begins each day with a gentle yoga session in our dedicated yoga room. Days out are 4-6 hours (300-800m altitude gain) discovering the delights of walking in the snow. You will head up to mountain refuges, make igloos and build camp-fires to cook delicious local duck and roasted marshmallows. In the evening you’ll be in the bubbling thermal baths to ease your muscles or enjoying short, relaxing yoga sessions before dinner. Dates: every week from 5 Jan – 13 April 2019. From 4P. Email: Mandy. 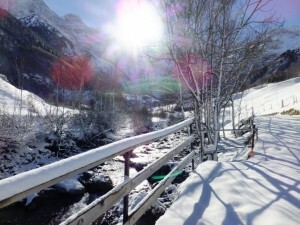 Luz Valley & Marcadau Hut Trip: Your snowshoe week is split between the stunning Luz and Cauterets valleys – five nights in the comfort of Hotel Les Templiers in Luz and two nights in Refuge Wallon, in the heart of the Marcadau Valley for a real winter mountain experience. From the refuge we can head higher up to the Spanish border passes, tackle some smaller summits and walk to frozen lakes. A great combination. Dates: every week from 2 Feb – 6 Apr 2019. 16 – 23 March 2019 CONFIRMED. Runs from two participants, so find a friend and we can confirm, or let us know your preferred date and we’ll try to encourage another to come then too. Email: Sian. Encantats Hut to Hut Trek: You will be ‘enchanted’ by the magical beauty of these mountains in the Spanish Pyrenees! One of the Pyrenean lake districts, the Encantats area has great refuges, thousands of frozen lakes to walk over and magnificent granite scenery. A hut to hut snowshoe trek is the ultimate winter experience and every year this one is different. Min 6P. Dates: mid Feb – mid March. Contact: Email Sian.